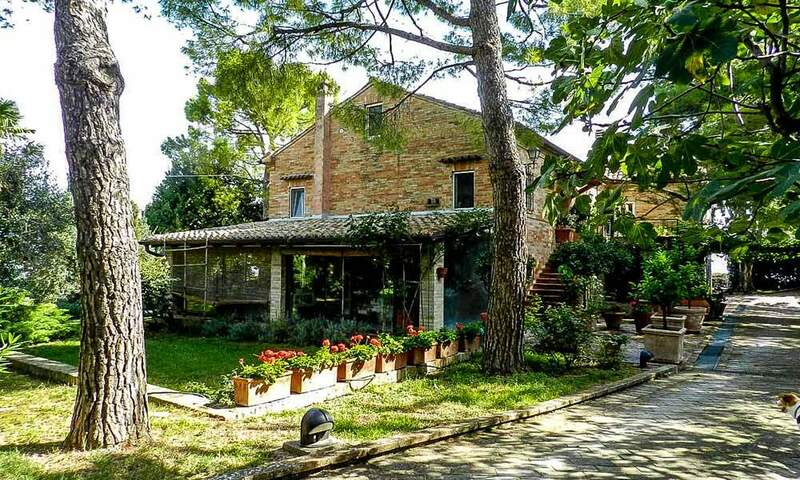 Casale della Rupe is a casolare that has been painstakingly restructured to incorporate modern refinements for a comfortable contemporary lifestyle, whilst maintaining the original features and a rustic charm. Traditional materials recovered on site such as stones, cotto tiles and oak, have been used throughout, together with some modern additions, as glass, stainless steel and resins. The exceptional outcome has been achieved thanks to the close collaboration among the owners, the architect, local skilled artisans, and international artists. Smerillo is a hamlet located in Southern Le Marche in the province of Fermo, an ancient papal state that houses a Golden/Silk mantle once belonged to St Thomas à Becket, the martyred Archbishop of Canterbury. Many of the wonderful hilltop towns have links with Papal history. A sunny south/western exposure, with far reaching views of the Sibillini Mountains, San Ruffino Lake and a myriad of hilltop ancient towns adorn this property with unrivalled panoramic views and sunsets. The house is reached through a uniquely designed iron gate, gravelled driveway, with parking and turning area to the front and leading to the side and back of the house and outbuildings. The building develops on staggered levels, to follow the natural slope of the hill, although internally you are basically on 2 floors only. The very heart of the house is placed in the middle, where a glass and iron staircase, designed by the current owner and handmade by a local artisan, leads you to all rooms. What is interesting about this house is that almost all rooms have a direct link with the external area, especially with the garden and pool. From the front parking and turning area, a gravelled path guides to an outer staircase leading to a glassed porch, itself leading to the entrance hall: a large dual-aspect reception area with open fireplace, partly preserved original cooking recess and two elaborate antique double doors to the drawing room: it is generously sized and features a full height ceiling with vaults, open fireplace, numerous windows to guarantee plenty of light, two oak-framed glass double doors opening to the grand terrace measuring 30 sq.m. with views of the Sibillini Mountains, also known as Monti Azzurri. On the opposite side to the entrance, there is a music/bar room with 6×2 metres glass wall. Beside, there is a cloakroom and a staircase leading to the master bedroom, featuring an ample ante-room leading to the large and bright bedroom, with en-suite bathroom including a Jacuzzi, shower with massage jets, oversized shower-head and a walk-in wardrobe. A French window lead you out to a private terrace, overlooking the beautiful landscape made of hilltop towns and multicoloured countryside. A separate exit door leads out to the garden area. The illuminated glass-stairs step down to the ground floor, with 2 bedrooms with en-suite bathrooms, a laundry-room and an additional bedroom, with en-suite bathroom, accessible only from the garden. A stone-built staircase leads to the wellness area, equipped with Sauna, Turkish-Bath, both accommodating up to 5 people, and cloakroom. On this floor, there is also a technical room. A passageway will lead you to the lovely and well illuminated studio/library, while through a glass door you can reach the kitchen, dining room and living room. The kitchen is fully equipped with Arclinea kitchen furniture, Gaggenau and Scholtés appliances, a central island, 2 ovens and much more. The living room is spacious and directly illuminated, thanks to the numerous windows, the white walls and the resin floor, reflecting the natural light that comes from outside. Three double Oak-framed glass doors lead to either a portico, pergola or loggia areas for outdoor summer living. The pool and the BBQ area are connected with water and gas and conveniently positioned by the kitchen, allowing hosts to be in the midst of the action. On the grounds there is an outbuilding that at present is a ruin with planning permission and architectural drawings for its conversion. Plans and planning permission are available. In addition to this, there is an ample garden storage/workshop of aprox. 55 sq.m., a double garage and further independent en-suite accommodation or gym above garages measuring aprox. 60 sq.m. The land comprises 2 hectares of fully fenced meadows, a continuous running spring, native woodland, lawns, orchard and soft fruit shrubs, olive trees, ornamental trees and flowering shrubs, gravelled pathways, oak and gravelled stairwells, mature oaks and walnuts. On the land, a beautiful panoramic pool will give you moments of relax. The pool has a saline system. The location is simply amazing: secluded but not isolated, Smerillo is just 300 metres as the crow flies, a 2km drive. In front of you, a 180° views over the Sibillini Mountains, the multicoloured hills typical of region Marche, San Ruffino Lake and myriads of small medieval villages will grab your eyes.